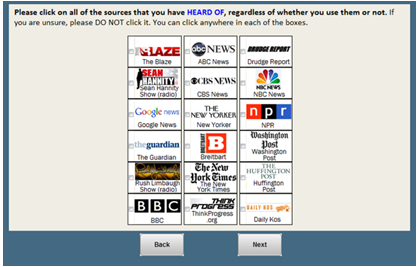 In Wave 1 of the American Trends Panel questionnaire, Web respondents were asked a series of questions about news sources for information about government and politics. Respondents were first asked whether they have heard of 36 sources. Icons for the sources were arrayed on two screens of 18 sources each, randomized within each screen, as shown below.5 Respondents first clicked on the icons of the sources they have heard of. Of the sources that they had heard of, respondents were then asked whether they trust each source – again indicated by clicking on the icons. They then got another screen which showed the sources they had heard of but had not indicated that they trusted, and were asked if they distrust any of those remaining sources. If a respondent had heard of a source but did not indicate trust or distrust of it, the response was considered “neither.” Finally, respondents were asked if they got news about government and politics in the past week from any of the sources that they heard of, in addition to local television news and five social networking sites – Facebook, Twitter, Google Plus, LinkedIn and YouTube. 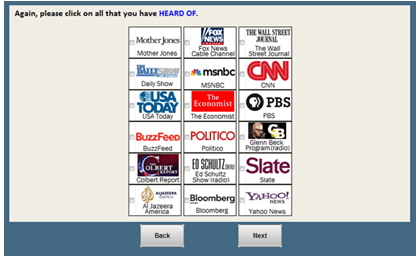 These sources (42 total, including local television news and the five social networking sites) were specifically chosen so as to ask respondents about a range of news media, both in terms of platform and audience size, including some sources with large mass audiences, as well as some niche sources. Most of the sources are drawn from those asked about in past Pew Research Center surveys on media consumption. Many of these sources are widely known and have large audiences. From this initial list, researchers went through an iterative process to add additional sources to provide a greater range in the news media environment – including adding more international, radio and primarily digital sources. The final list is based on results of a pilot test by the Pew Research Center, along with audience estimates and whether the outlets are sources for government and politics. The final list of 36 sources asked about in wave 1 of the American Trends panel Web questionnaire consisted of the following: all three major broadcast television stations (ABC News, CBS News and NBC News), the three major cable television news networks (CNN, Fox News and MSNBC), local television news, four of the largest circulated newspapers (The New York Times, The Washington Post, The Wall Street Journal and USA Today), the two major public broadcast networks (NPR and PBS), international media organizations (BBC, the Guardian and Al Jazeera America), news aggregator websites (Google News, Yahoo News and BuzzFeed), news magazines (the Economist, Mother Jones and the New Yorker), economic news sources (Bloomberg [along with the Economist and the Wall Street Journal]), four political news radio programs with the largest audience bases (the Ed Schultz Show, The Glenn Beck Program, the Rush Limbaugh Show and the Sean Hannity Show), infotainment television shows (the Daily Show and the Colbert Report), and primarily digital sources, some with large audiences that rival some traditional media outlets’ Web presence (the Drudge Report and the Huffington Post) and others with more niche audiences (the Blaze, Breitbart, DailyKos, Politico, Slate and ThinkProgress).